Increase sales: Sell products you don't have in stock yet. Prevent out of stock situations: Be notified before inventory gets too low. Monitor your inventory: See directly which products are out of stock and are wanted most by your customers. Average increase of revenue by 710,91 euro per month for all Inventory Alarm users. Our purpose was to develop the most simplistic and user friendly App that will help all webshop owners to be aware of low inventory "the easy way" and at the same time automatically inform custumers when a product is available again. From now on Inventory Alarm will take care of it. How does Inventory Alarm work? By setting an alarm in the Inventory Alarm dashboard, you will be notified once the stock of a certain product reaches your alarm level and a final notification when it is completely out of stock. 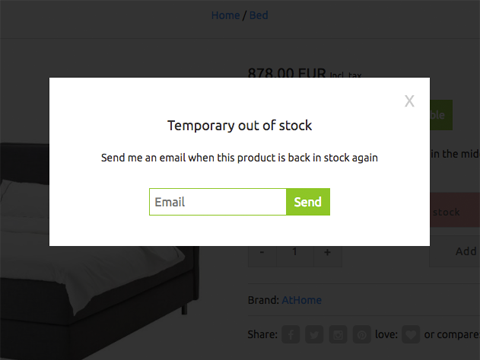 When a complete stock out occurs, your customers can leave their email on the product page and will be notified once the inventory is refilled. Pre-order products: Use Inventory Alarm as a pre-order system by placing a product in your store but removing it from stock. As soon as you order the product, customers will automatically receive an email. Automatic integration: The app works out of the box with all themes of Lightpeed together. Even if you have activated the template editor. Multi language support: Inventory Alarm includes support in English, German, French and Dutch. So even if you cross the border you can use the app. Crivex quality: This app has been running stable with the Lightspeed platform for more than 2 years. Our support is always active and is happy to help with custom orders. BONUS: OMNICHANNEL-proof: Customers confirm that this is one of the few apps that also continues to do its work omnichannel. Of course! You can see a demo of an out of stock product page here. Once installed, click here to login directly to your Inventory Alarm Dashboard. By installing the application you agree to our terms and conditions. Visit our online helpdesk or send an email to [email protected].